This strange machine was shown at Comdex in 1987. It was designed for graphics intensive applications taking advantage of the parallel processing capacities of the INMOS transputer. Two models were sold: one of them was a card which could be connected onto a Mega STf bus expansion to use its peripherals (keyboard, disk, etc.). 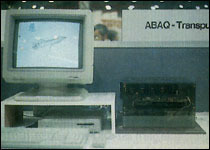 The other was a computer in which there was a motherboard with a single transputer plus a card which contained all the Atari Mega STf hardware to use its peripherals! The motherboard included slots to add up to four more processor cards, each with up to four transputers, to enable multiprocessing. It ran under Helios, an operating system done by the British company Perihelion, derived from UNIX but specially adapted for parallel processing). A C language was adapted and a parallel processing language called OCCAM. Only few of these computers were sold, most of them to Kodak. see more Atari Abaq ATW Transputer 800 Ebay auctions !